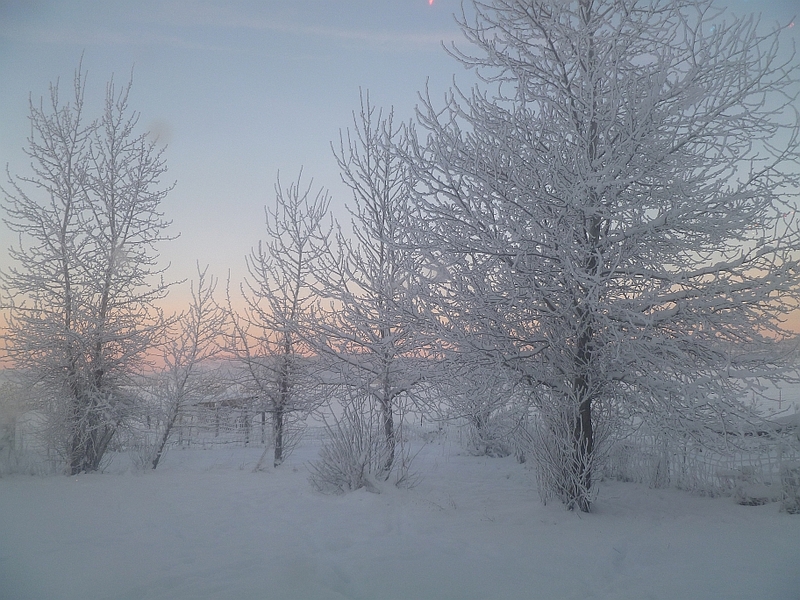 It was spectacularly cold this morning - 6 below zero - but absolutely clear as a bell and breathtakingly beautiful. A thin crescent moon preceded the sun in the east by an hour or so. The pre-dawn was pearly and peaceful, frozen into immobility. ...a spread a warm glow across the land. As the sun rose higher, it backlit the trees behind the barn, turning the hoarfrost into diamonds. Unbelievable. A good day to chop wood, both for the immediate warmth and for the woodstove. JJ, our feral half-blind sorta-crippled barn cat, got caught in a sunbeam and couldn't move for a couple of hours. ...and then a spiffy sunset. What a heck of a way to start the new year! Happy New Year to you too Patrice, your family, and everyone who reads your blog. Thanks for the pictures, God sure does a great job at winter beauty. Girl, may you always have a ready digital camera card handy. These are really good to look at. The temperatures here this morning were in that range, too, but I think you've got us beat by a few degrees. It's definitely thermal underwear and flannel-lined jeans weather. There's hoarfrost in the tall green grass (which we have year round, lucky deer)and the pond looks like frozen ripples. Two days ago there fell what I initially thought was sleet, but which was actually something the meteorologist called grauple. Do you get that there, Patrice? Any readers know about this stuff? It actually looks like large grains of styrofoam. Pretty neat looking. And jumping topics from ice to fire...please notice the little blue feedburner window toward the upper left corner of the home page. It's not far below that gorgeous handmade Lewis Tankard now available here...!..oh, yeah..the feedburner: There are 698 readers at the time I'm posting so by golly we're about to see the site break the 700 readers mark. It's great to see the steady growth. Good stuff, Don and Patrice. Great way to kick off the year. I'm gonna brew a mug of tea and drink to your health and prosperity, and the same to the good souls who gather here. Oh my!!! These are absolutely breathtaking. Suitable for framing!! You really do live in God's country!! Happy New Year!! I don't know whether to feel relieved or jealous, as our New Year was 60 degrees here in KY.
44 in Sacramento on sunday morning. Bur minus six degrees below zero isn't that a double negative making it positive? But seriously gorgeous pictures. Happy New Year! Always learning so much here. AP that's a heck of a deal...lost in the grauple! lol Girl I hope you find out if you made it back. Let me know if I should call Mantracker! How do the animals stay warm? Do they go in the barn? They always have barn access and many tuck themselves in at night (though others prefer to stay outside). They stay warm primarily by digestion, believe it or not. Animals must eat more in cold weather in order to keep their bodies warm. Oh, ok. I was thinking of your cute chickens waking up popcycled in the morning. :) I hope I didn't wake you up. I was catching up on your blog from the start of the new year. There was a heated discussion going on about the lady from New York. Yikes! It is 1:15 am in Chicago and time to go to bed. Goodnight.